Author Roy MurrayPosted on February 19, 2018 Categories Muncipal Election, Opinion, PoliticsTags John Tory, Ontario, Rob Ford, Toronto City Council, Toronto Council3 Comments on Income inequality linked to crime. An artist impression of the future Mount Dennis Station at 3500 Eglinton Avenue West. Just as the UP Express is beginning to make a difference in Weston, according to an Inside Toronto article, people in Mount Dennis are anticipating a boost to their area as a result of the Eglinton Crosstown and the new Mount Dennis Station. The 19 km line with a 10 km underground stretch between Keele and Laird is set to open in 2021 after ten years of construction. Incidentally, without former Premier Mike Harris, we could be riding a different version of the line today. This is a map of the subway line that Harris buried (and not in a good way) in 1995. The subway line that we could be riding today if Mike Harris hadn’t killed it in 1995. The Eglinton West Line would have run from Eglinton West Station all the way to Renforth along a right of way that had been reserved for the Richview Expressway (killed in the 1970s). Sadly, the Eglinton road allowance was sold for small change by Rob Ford in 2010 but nobody thought to tell John Tory as he was putting crayon to napkin for his SmartTrack plan. The allowance is now being filled in with some spectacularly awful townhomes. Gratuitous side note: right wing politicians claim to be able to lower costs but their penny wise antics often end up costing us more in the end. 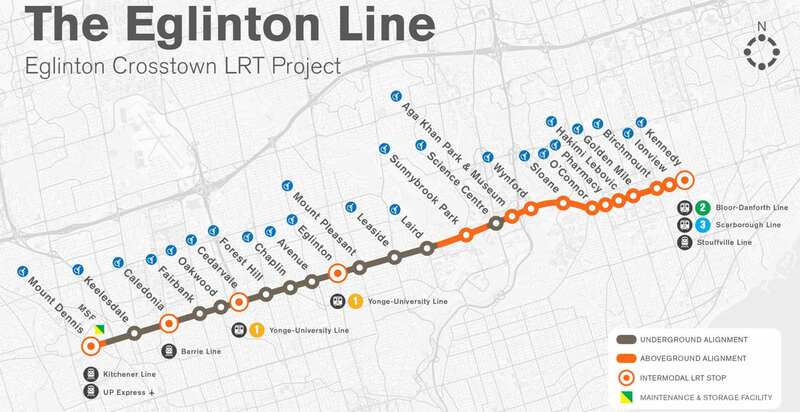 The latest iteration of an Eglinton line. 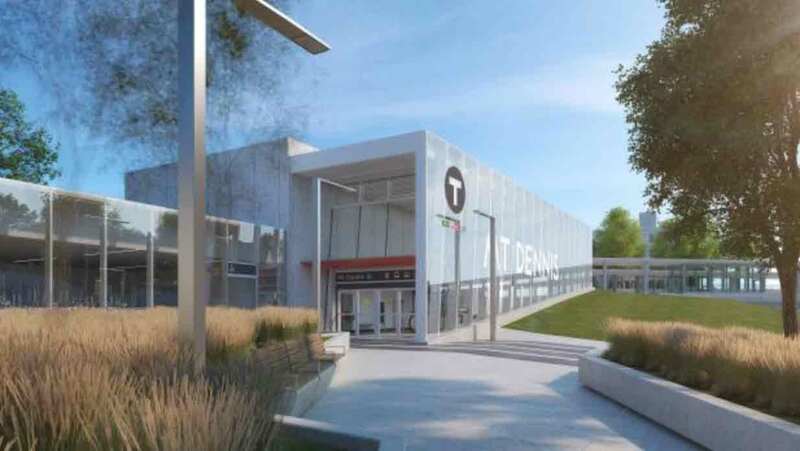 The new Mount Dennis Station will adapt the old Kodak Recreation Building and will be part of a transportation hub connecting with buses and the UP Express lines. Let’s hope that combined with the end of the vacant property rebate, the new transportation infrastructure will actually breathe fresh life into the area. From the mayor’s Twitter account. 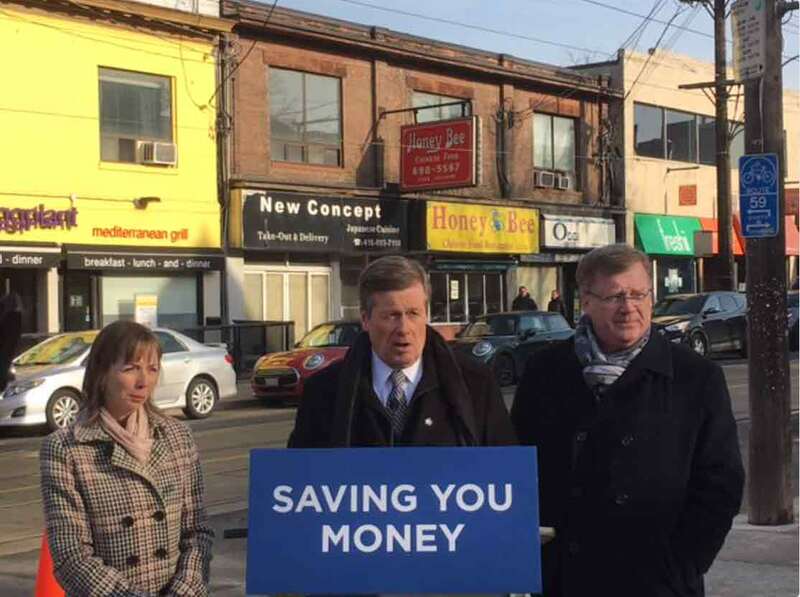 Today’s announcement from the mayor (standing behind what looks like a sign recycled from a Rob Ford presser) is to the effect that empty stores should not continue to receive a property tax rebate. Here at Weston Web, we are grateful that the mayor has obviously been using our search feature and reading back issues. We pointed out the unfairness of this tax situation back in 2013. Hopefully, hizonner will check through Weston Web for more hints on how to do things better in Toronto. Perhaps that will help boost his dismal 55% popularity rating. After four years of being accused of being too gentle with the rambunctious Mayor Rob Ford, today Council speaker and our councillor, Frances Nunziata finally tossed (now Councillor) Ford from the council chamber. Ford’s sin was to make unwarranted accusations against defenceless members of council staff. Regardless, he stamped his feet and insisted on a council vote before he could be persuaded to take the hint. Kindred spirit Giorgio Mammoliti exiled himself in sympathy as Ford left the chamber. Ever the master of the put down, Mammoliti declared afterwards that ‘Nunziata should get off her high horse and start riding a donkey for a while’. While it’s unclear what Councillor Mammolliti was referring to, the rest of us can only hope that she heeds the advice and continues to ride both donkeys. Doug Ford made his first campaign stop at a fundraiser for the local Frontlines organization, according to John Nunziata. Ford is a close ally of the Nunziatas—who are both running for city councillor seats. Frances Nunziata endorsed Rob Ford in the last municipal election, and Ford nominated her for council Speaker. This time around, Frances Nunziata has not (yet?) endorsed a mayoral candidate. (She did not respond to my request for comment.) Last night, however, she campaigned with Doug Ford and her brother in Ward 12. Thanks to Melissa for the tip. This week, the Fords released six videos. In one of them, Rob Ford lists the councillors he wants defeated—and the ones he thinks shouldn’t be. Frances Nunziata, our councillor, makes his short list of core supporters: she is one of only four he thinks deserves reëlection. ¹ These are Doug’s words. I know you know, but the “biased media” argument is the last refuge of a nutter. We’re witnessing the final thrashings of a man dragged into the light. Look at the backdrop of the video. It’s a wrinkly vinyl sign. My god; it’s Shakespeare. Ford had to hide under a vinyl sign in his final days—it is his family standard and his father’s blanket. Listen to the video. They sound like they’re far away and echoey. Ford Nation is produced by Wayne’s World local access cable—if Wayne were bereft of wit and irony. ² Sons should call their mothers. Nunziata defends November 18th Ford vote. On November 15, and November 18th Toronto City Council voted to limit Mayor Rob Ford’s power. On the 15th, council voted to take away his power to appoint members of the Executive Committee (similar to cabinet positions). That power was given to Deputy Mayor, Norm Kelly. Councillor Nunziata supported this move. On the 18th council voted to cut the Mayor’s budget, remove his power to set the legislative agenda and remove his ability to fill vacancies of the civic appointments committee. Councillor Nunziata did not support this move. I believe that removing the powers of a Mayor who was duly elected, whether we like him or not, is undemocratic. Unfortunately, this ‘respect for democracy’ is inconsistent with her vote on the 15th November to remove Ford’s power to appoint Executive Committee members. While Councillor Nunziata seems to be sucking and blowing at the same time, at least she voted; unlike the endlessly amusing Giorgio Mammoliti who abstained on both days. Let’s hope the councillor in her role as Speaker can do a better job of reining in the Ford boys and their antics in the next few months. Author Roy MurrayPosted on November 24, 2013 Categories Opinion, PoliticsTags Frances Nunziata, Norm Kelly, Rob Ford, Toronto City Council4 Comments on Nunziata defends November 18th Ford vote.